Magna Graecia is a name for coastal areas of Southern Italy on the Gulf of Taranto. This part of Italy had many Greek settlers. 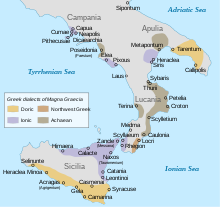 Magna Graecia is Latin and means "Great Greece". The settlers began arriving in the 8th century BC. After the Pyrrhic War in the 3rd century BC the area was added into the Roman Republic. This page was last changed on 17 September 2017, at 13:36.